These intestinal parasites can often be found in young puppies and kittens. They measure two to six inches in length and look like very thin pieces of spaghetti. Roundworm infections often cause puppies to appear pot-bellied or bloated, anemic, have diarrhea, weight loss and vomit. 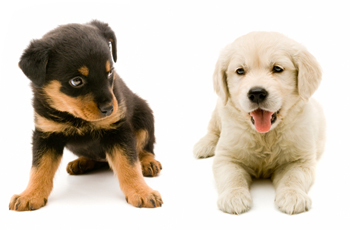 The puppies are often less lively and do not grow as well as uninfected puppies. Coughing is also an occasional symptom of roundworm infections. Since the parasites can travel from the mother to the unborn, puppies are often born with roundworms. Young puppies can also become infected while nursing. (Roundworm larvae are passed in the mother's milk.) Adult dogs become infected by ingesting material contaminated by feces or by ingesting small rodents. (Rodents are carriers of roundworms.) After hatching in the dog's intestine, roundworm larva are carried by the bloodstream to the lungs. From the lungs, the larvae crawl up the windpipe and are swallowed. Once the larvae are in the intestine, they grow to adulthood. Coughing occurs when the larvae are in the throat. Accurate diagnosis of roundworms is important since they can cause serious problems. Puppies can die from severe roundworm infections. A one month old puppy should have his (her) stool examined for roundworms. As a precautionary measure, many veterinarians routinely treat young puppies for roundworm infections. At the time of puppy vaccinations, stool examinations should be performed. Adult dogs should have a stool sample examined for worms at least twice a year (Spring and the Fall). Anytime a dog has a digestive tract problem, a stool exam can detect or rule out the presence of internal parasites. A stool examination, performed at a veterinary hospital, not only detects the presence or absence of adult worms, it also detects the presence of worm eggs. The feces are mixed with a special chemical solution, and after several minutes, the solution is examined under a microscope. If worm eggs are seen, the veterinarian, or a trained technician, can identify the specific worm. The appropriate medication is then dispensed in order to eliminate that particular worm. When bringing a stool specimen to the veterinary hospital, it is best to transport it in a small ,clean glass jar. A fresh specimen is definitely best. An old specimen may no longer contain the parasite or the eggs. Stool examinations are an inexpensive method of detecting internal parasite infections in dogs. Early detection and accurate treatment will prevent these parasites from causing intestinal disorders. Along with vaccinations and regular check-ups, stool exams are considered part of the routine pet care given to all dogs.